We are proud to announce that HW Martin Waste Ltd is a 2018 recipient of the Resource Association’s annual Quality Recognition Awards. 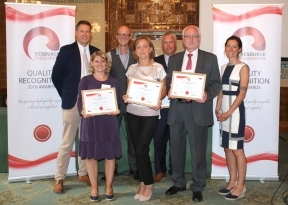 At a ceremony held at the National Liberal Club in Westminster, London on 16th July, the company received the award after being nominated by Novelis Recycling – the world’s leading recycler of aluminium, recycling around 60 billion used drinks cans globally every year. HW Martin Waste Ltd produces several thousand tonnes of high quality recyclable materials at its Materials Recovery Facility (MRF) in Leeds every year, and has been doing so since 2007. The UK’s leading re-processors use materials from the Leeds MRF, including paper, steel, plastics, glass and aluminium. The company’s MRF is also a base for regular educational sessions for local schools and visiting groups keen to learn more about the recycling industry. Nominees for the award must meet criteria including achieving a relevant industry quality standard with no loads of recycled material supplied rejected by the reprocessor during the 2017/18 financial year. Speaking about the award, Dec Nortcliffe, National Recycling Manager for HW Martin Waste Ltd, commented: “It is great that Novelis nominated us for the award and we are really pleased to have received it. We have worked with Novelis and many other blue chip companies in the recycling industry for several years and I am pleased to say we are a supplier of choice when it comes to them wanting consistently high quality material.